As you know, I have really been trying to be conscientious about getting enough vegetables into my daily diet. The meal plan with the 21 Day Fix makes a lot of sense for me. When I stick to the plan, I can feel the difference through my energy level and on the scales. However, it can be a challenge to get all of the recommended servings on days when it is so hot outside that it is difficult to eat several times a day. After our trip to Vegas and enjoying Jamba Juice for a few days, I really began to crave smoothies, especially knowing I could manage my vegetables through the right recipes. I found the recipe to the Greens Smoothie from Jamba Juice plus I tried a few others. Here is what I have discovered. You can throw almost anything into the blender and make a good smoothie! Andrew and I went to Costco today to load up on a few fruits and veggies in preparation for our smoothie week. A smoothie for lunch fills me up for at least 2 hours, often for over 3 hours. Plus, all of the great nutrients I am getting are amazing! I love having them because it feels as though I’m having a fun treat, not a glass of veggies. Chia seeds are such a great health benefit for us, plus they are so easy to add into a smoothie for extra health kick! Just mix 1/2 cup of water, almond or coconut milk (or any kind of milk) with 2 Tbsp chia seeds. Let sit for about 10 min. Can be refrigerated for up to 4 days and added to oatmeal, smoothies, yogurt, soups, etc. You can play around with the smoothie ingredients very easily to add variety. The tip to remember is when using spinach and kale, the taste is always masked with the other ingredients. Once you decide what fruit taste you want…the rest is pretty simple. You can add in fruit juice and more ice to make it more of a fruity taste, just beware of any added sugar. If you use frozen fruit, you don’t need as much ice, if any. What I am loving about the smoothies is the endless list of options and flavors. I tend to eyeball the amounts, so often end up with a really big smoothie and enough to share with Andrew. This is what makes a smoothie so awesome! You can hide almost any superfood in without the taste! Play around with the amounts and types of liquids you use to find what you like and of course it’s fun to mix it up! Also, you can add in some protein powder, if desired! Peanut butter – or any nut butters are great for adding flavor plus nutrients! Healthy smoothies provide a great alternative to trying to prepare a balanced meal at lunchtime when you are rushed for time. It takes about 5 min to get a smoothie ready, plus it is so easy to run out the door with. If you would rather have another recipe to follow, at least the first few times, be sure to check out the Jamba Juice Greens also! 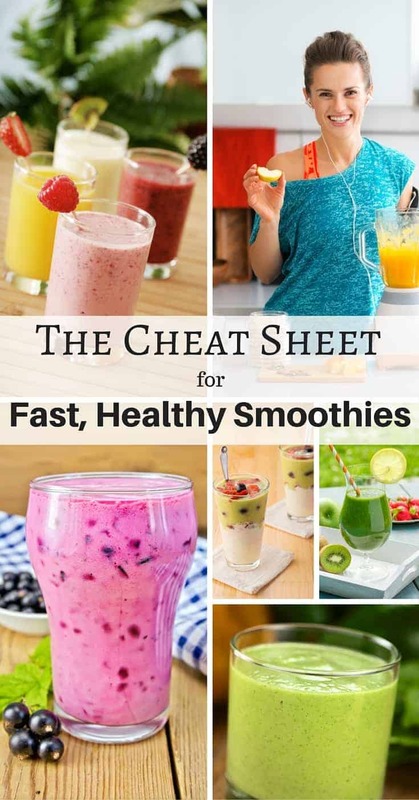 Have questions about healthy smoothies? Ask below, on social media or email me! What smoothie ingredient combinations are your favorite? Make a smoothie and tag me in Instagram @fitfoundme!